The Tide & leading scorer Rory Agu face a Canadian invasion this weekend. 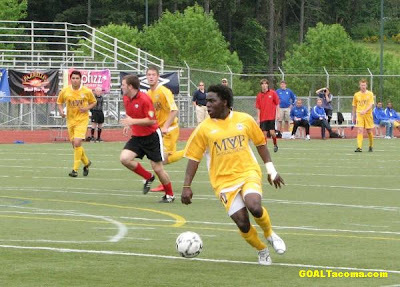 Tacoma Tide FC know the next four matches are critical in their 2008 PDL season. You can only play them one at a time, of course, but it is easy to see that this weekend's matches against Canadian sides from Abottsford and Vancouver and the road trip the following weekend to Utah will go a long ways towards deciding 'who' the Tide are this year. Are they the club that has outscored opponents 15-1 at home? Are they the club who has fallen behind and lost both road matches while being outscored 8-3? Somewhere in the middle? The Tide host the Abottsford Mariners Friday night at Curtis High School at 7:00 PM. The Mariners called themselves the "Rangers" when they previously faced TFC. In fact, the last time Tacoma lost a match at home was to Abottsford way back in July of 2006, 2-1. Since then the Tide have strung together a 13-match unbeaten string in University Place that includes a 2-2 draw with defending USL-1 Champion Seattle Sounders. Vancouver Whitecaps Residency are a new club in the PDL Northwest Division this season. They have started life by winning their first three matches. The Caps have the afore mentioned win over Abottsford along with a 1-0 victory at Cascade Surge and a 4-1 thrashing of BYU last week in BC. Kyle Porter has already scored three goals for Vancouver. The Mariners and the Caps will give Tacoma their best shots. Both teams will be rested and ready. While Tacoma will play Vancouver the night after hosting Abottsford, the Whitecaps have Friday night off and will come in well-rested to Curtis High School on Saturday night June 7th at 7:00 PM. The Tide have a 3-2-1 record after six matches and look to be battling with Vancouver and Yakima for the two division playoff spots. Rory Agu leads Tacoma scoring with six goals. Fan give-aways are planned for both nights. Also, after the game on Friday night, join the Tide players and staff at Farrelli's Firewood Pizza.